Day 1: I’ll introduce some vocabulary associated with Halloween by showing them this video. As we are watching, I’ll pause and ask questions—mostly about colors since their vocabulary is so limited at this point. After the video, I’ll pass out this vocabulary handout that the students will use as a resource throughout the mini-unit. Next, I pass out a baggie of picture cards to each student for a Bingo game. I created these cards by printing the 30 copies of this document on tagboard and then cutting the squares apart. I strongly recommend using as many different colors as possible—This really helps when you find that one spare card on the floor! Once each student has a baggie of cards, I’ll instruct them to choose 25 of the cards and organize them on their desks in 5 columns of 5 rows. (There are 30 cards, so 5 won’t be used). I then call one word at a time, and the students turn over that card if they have it. The first student who turns over 5 cards in a row is the winner and must say the words s/he used for the bingo before receiving a prize. Although this game only practices vocabulary in isolation, it does allow the students to hear the pronunciation several times and begin to create meaning between the picture and sound of the word. 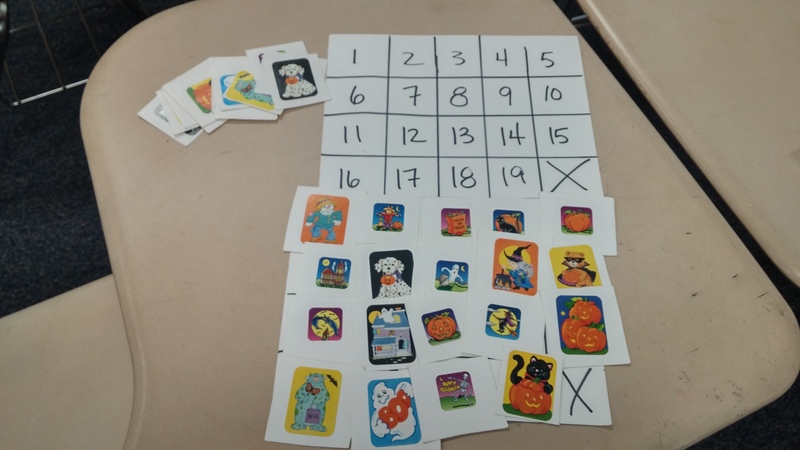 After several rounds of Bingo, I’ll have the students play “Go Fish” with a partner using their combined sets of cards (I make sure that each partner has a different color so that the sets can be separated at the end of the game.) At the end of the period, I’ll play this video as a closing activity. Day 2: I’ll begin this lesson with this song and then review the vocabulary by asking questions about these slides. (C’est une sorcière ou un vampire? La sorcière a un balai ou un os? La sorcière porte un chapeau pointu ou un masque ?) After a couple of quick rounds of Bingo and a quick introduction to prepositions using this video the students are ready to begin communicating with the new words in this matching activity. For this activity, students are paired up and one is given a Partner A paper, while the other is given a Partner B paper. Both papers have the same pictures but in a different order. The students take turns describing a picture to their partner who will tell them the number/letter of the corresponding picture on their own papers. Both partners will then write their partner’s letter/number on the corresponding picture on their paper. I like to follow up these matching activities with a short formative assessment in which I describe a picture orally, and the students write the number/letter of the picture I’m describing. Day 3: I’ll start this lesson by reviewing the vocabulary using these slides of Halloween scenes. I ask questions about the first few slides and then have the students describe the next few. (I give them a minute to describe a slide to their partner, and then choose one student to describe the picture to the class as a formative assessment). Next, the students will complete this Same/Different pair activity. As a final activity for this lesson, I’ll project one of the Halloween slides and have the students describe it in writing. Day 4 – 8: Now that the students have practiced the vocabulary for a few days, I’ll divide them into groups for these learning stations, each of which will take one class period. Reading: The students will complete comprehension guides for three Halloween-themed stories. Two of the books, Le Couloir and Le Chapeau can be downloaded for a reasonable fee (which includes the additional books in each series) from this site: https://www.envolee.com/en/du_plaisir_a_lire . 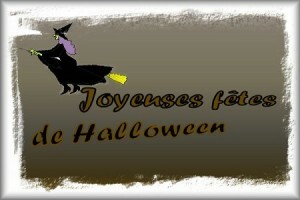 L’Halloween de Maria is found here: https://www.readinga-z.com/book.php?id=827 . A video of the story being read aloud is also available. Writing: The students will describe a series of Halloween stickers (or pictures) that are found at their station. Computer : The students will watch a video and answer comprehension questions. Day 1-3: Same as French 1. Day 4: I’ll read the story, “Histoire Terrifiante” (p. 1, p.2,p. 21/2 p.3, p.4) aloud to the students, who then complete the comprehension questions in their packet. Next, the students will work in small groups on this manipulative activity, in which they put sentences about the story in order. (I print the document on tagboard and cut apart each sentence.) The students will then complete a series of activities in the packet designed to introduce them to the use of direct object pronouns. Although I do little direct grammar instruction, I have found that this particular structure is not easily acquired so I like to have the students work with it enough that they can recognize these pronouns when they see them. Day 5: The students will practice summarizing the “Histoire Terrifiante” story using only pictures. I’ll then choose a few students to present for a formative assessment. They will then finish the direct object pronoun activities and complete this pair activity to reinforce these structures. Listening: Students will watch a series of Halloween-themed videos and answer comprehension questions. (I’ve included the questions here, but have created multiple-choice “quizzes” on Canvas that I will use with my students. Reading: Students will read a story called “Six Petites Citrouilles” (p. 1, p. 2, p. 3, p. 4, p. 5, p. 6, p. 7, p.8 )from a book called “L’Halloween de Napoleon.” Some of the students read books about Napoleon (a dragon) as young children, so they love reading this story! Because the print is hard to read on some of the pages, due to the background color, I typed the story in this document, which I will also pass out to students. Writing: Students write a note to a French penpal explaining how Halloween is celebrated in the U.S. Speaking: Students complete the same Matching and Sticker activities as the French 1 students, but also two additional activities (#1-a, #1-b, #2-a, #2-b) in which they discuss pictures in order to find the differences. Because each of these students was in my French 2 class last year, they are familiar with the Halloween vocabulary. Therefore, they’ll only need a quick review before beginning their learning stations. Day 1: Students review vocabulary with a partner crossword activity. For this activity each partner receives a crossword puzzle (A, B) in which half of the answers are filled in. The students must use circumlocution to help their partner fill in his/her missing words. When finished the read this article about Halloween and complete a comprehension guide. Reading Students read a story about a witch named Grasseboudine (p. 1, p. 2, p. 3, p. 4 ) and/an article about bats (p. 1 p.2) . Listening: Students will watch a series of Halloween-themed videos and answer comprehension questions. (As with the French 2 students, I’ve included the questions here, but have created multiple-choice “quizzes” on Canvas that I will use with my students. If you decide to try any of these activities, I hope your students enjoy them as much as mine do! This entry was posted in French 1 Units, French 2 Units, French 3 Units and tagged Halloween on October 12, 2015 by madameshepard.